Former members of the NanoSat Lab who are giving frequent support to current missions and projects. Pol Via was born in Barcelona in 1992. He obtained the BSc in Telecommunications Engineering by the Technial University of Catalonia – UPC BarcelonaTech and is currently pursuing a MSc in Aerospace Systems Engineering. 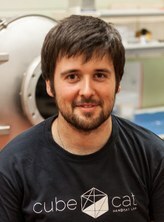 After working in various projects in the field of robotics, Pol joined the NanoSat Lab in 2014 as the AIV engineer for the 3Cat-1, 3Cat-2 and 3Cat-4 missions. His resarch interests comprise spacecraft design, spacecraft system engineering and AIV/AIT. Arnau Solanellas was born in Tarragona in 1991. He obtained his BSc in Electronics Engineering by the Technial University of Catalonia – UPC BarcelonaTech in 2016 and is currently pursuing his MSc in Electronics Engineering. After working in BCN3D Technologies and later in PAL Robotics, Arnau joined the NanoSat Lab in 2014 as Power Electronics Engineer for the 3Cat-1, 2 and 4 missions. His research interests include energy harvesting and storage systems, and power isolation and management. RF Engineer at Aistech Space. Ricard Castellà was born in Barcelona in 1992. He obtained his Bachelor degree in Telecommunications Systems Engineering at Barcelona School of Telecommunications Engineering (TelecomBCN - ETSETB). He joined to NanoSatLab team as research assistant in 2016, giving support to the ONION project and implementing hardware for new subsystems in the lab. 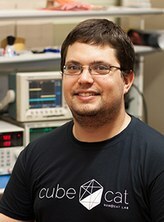 His main tasks consist in developing hardware for communication networks over Ethernet, USB and other standards, in order to apply them in the lab's subsequent missions. Xavier obtained his BSc and MSc in Aerospace Engineering by UPC BarcelonaTech, specialising in Space Engineering. 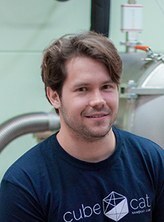 He held an undergraduate researcher position at University of Pisa (Italy) during his BSc, and completed his specialisation in Spacecraft Design and Spacecraft Dynamics and Control at the TU Berlin (Germany) during his MSc. He joined UPC's NanoSat Lab in 2017 where he led the thermal analysis for the 3Cat-4 mission as part of his master thesis. Additionally, Xavi is involved in the thermal model of the FSSCat project. 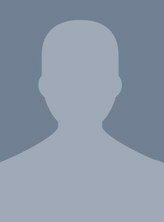 His research interests include solar systems, deep-space exploration and space debris mitigation.